Nilgiri is a pretty cardigan with a geometric lace pattern. 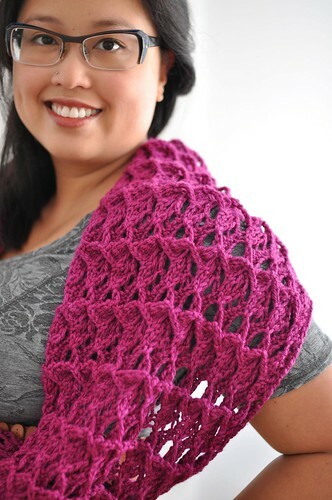 The unique stitch pattern is easy and fast to work, and great for a beginning lace knitter. The relaxed shape of this cardigan is perfect dressed up or down. Neat hems and garter stitch bands offset the lacy pattern. The body of Nilgiri is worked in one piece from the bottom up, beginning with a provisional cast on and knit-in hem. Sleeves are worked flat from the bottom to the underarm, then joined together with the body to work the seamless raglan yoke. Shown in size 37.75″ / 96cm. Available in Afternoon Tea Volume Two. 6 page PDF pattern with charted and written directions, abbreviations and schematic. Measurements in imperial and metric.